To commemorate the one-year anniversary of our 80-member harvest-share program, otherwise known as a CSA, we are proud to launch an event series that celebrates the strengthening link between food, farming and the local community. The program has been a great success. Eckerton Hill’s CSA enlisted 35 member families in its inaugural season last winter, and has more than doubled in size since its launch. The three events will take place between September and October, and although all of them center on local food and farming, each one has a unique theme. Sunday, September 15 / 12 – 3 p.m. Extending Your Growing Season is a hands-on gardening workshop hosted by Stark whose goal is to teach participants how to optimize their gardens through the colder months and extend the shelf life of their homegrown produce through the winter. The 2-hour workshop will be followed by a farm-raised lunch prepared by Eckerton’s resident “Farmhouse Chef” Mario Juarez, who previously worked in the kitchen of New York’s Esca Restaurant. The event will take place on Sunday, September 15 from 12 – 3 p.m.
Friday, October 4 / 5:30 – 8:30 p.m.
Wood-Fired Pizza and Movie Night is geared towards families. Chris Field, one of Eckerton’s farm managers whose previous career was a bread baker for Sullivan Street Bakery in New York, will be firing up the farm’s newly constructed hearth oven to bake farm fresh pizzas. The latter part of the evening will feature an outdoor film screening of a kid-friendly documentary. The event will take place on Friday, October 4 from 5:30 to 8:30 p.m.
Visit the page dedicated to Oley Valley Weekend 2013: click here. RSVP by September 10 at dinnerinthedell.eventbrite.com. 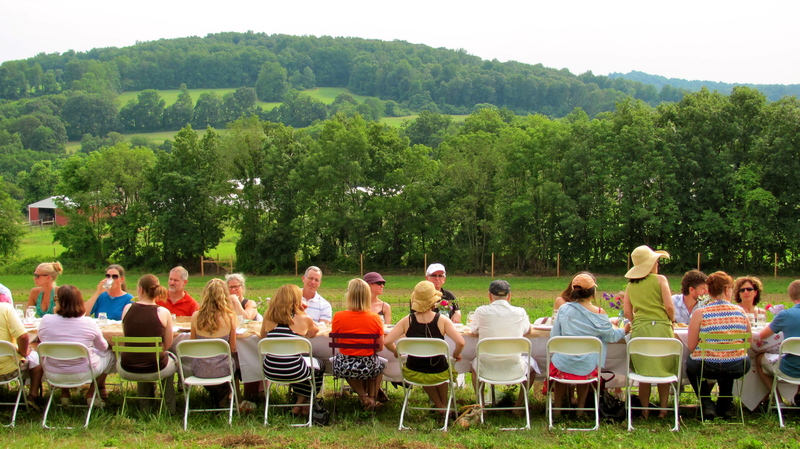 On Saturday evening, join us on the scenic hillside of Eckerton Hill Farm for a five-course dinner prepared with the fruits of the land where the table is set. James Beard award-winning Chef Dave Pasternack will prepare the meal at your tableside. The farm raised supper will feature regional wine and craft beer pairings and an opening lecture by a renowned organic farmer. Dinner in the Dell is the farm’s most cherished annual tradition, and our way of celebrating late summer’s beautiful bounty of food in the very place it were it was grown. On Sunday morning, join farmer and author Tim Stark for a tour of the surrounding Oley Valley’s family farms. Learn about the growing practices that produced the ingredients on your plate the night before. Tim will guide you around the fertile valley where you will have the chance to visit award-winning mushroom farm Oley Valley Mushrooms and sample wines at family-owned and operated Blair Vineyards. Tim will end the trip with a personal tour of his own farm, Eckerton Hill, during which he will discuss his organic and heirloom vegetable growing practices. To get there, use our free transportation or follow us in your own vehicle for a joy ride on winding country roads with scenic vistas to be enjoyed throughout. Attendees of both of Sunday’s events can help themselves to a complimentary pizza baked in our hearth oven for lunch. The Radiant You Wellness Retreat & Vegetarian Dinner is focused on energizing the body, mind and spirit. Organized by Grace Galanti of Aurum Holistic Skincare, the workshop features a yoga session perched on the scenic Eckerton Hill with instructor Dorian Abel of Healing Yoga. Then, attendees will experience Dr. Hauschka’s “Radiant You” detoxifying self-facial while sipping on supergreen Stark Naked Juice. The evening will end with a vegetarian, farm raised dinner prepared on site by renowned Chef Gracie Skiadas of Gracie’s 21st Century Cafe. The Retreat will take place on Sunday, September 29 from 1 to 5 p.m.